Condensed track profile charts are engineering documents giving mile-by-mile documentation of every aspect of a railroad’s right-of-way and trackwork: track layout, grades, curvature, bridgework, etc. On the Chicago, Milwaukee, St. Paul and Pacific Railroad (the Milwaukee Road), these were company documents issued by division. The Idaho Division extended from Avery, Idaho, adjacent to the Rocky Mountain Division, to Othello, Washington where it connected with the Coast Division. In addition to the main line, it included the Spokane passenger line, and Elk River, Metaline Falls, Coeur d’Alene, Moses Lake and Marcellus branches. 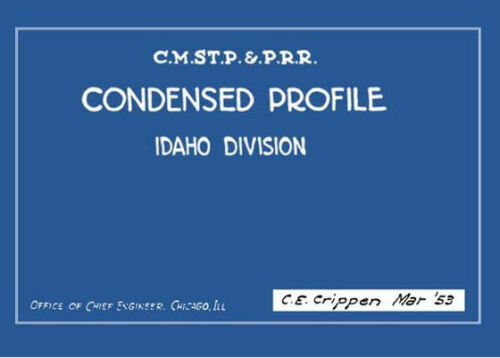 As these documents are relatively scarce, Merrill Publishing Associates has chosen to reproduce the 1953 Idaho Division condensed track profile chart to share with others interested in the Milwaukee Road. Soft cover.